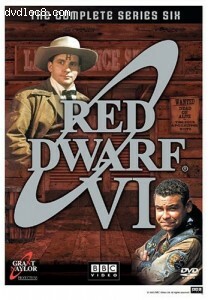 This page contains easter eggs for the disc Red Dwarf: Series 6 (DVD, Region 1). Have to access this one with the intro to the menu playing. After your POV goes into the Starbug and you go through the first airlock door, there's a button on the right side of the doorway. Select as soon as it turns red, then you'll go into the mid-section with a planetoid map. "You Are Here" gives you test Starbug cockpit footage, but no sound. "SVC01" gives you Starbug computer graphics for programming Rimmer's light bee with form and personality traits from Psirens. "SVC02" gives you the player selection screens from "Gunmen of the Apocalypse". "Clear Map" will take you to the regular menu.